Cat-flavoured Sunday roast and meat-flavoured beer... now man's best friend can join him for a hair of the dog down at their local pub. The Brandling Villa in South Gosforth, Newcastle, is selling a special beer designed for dogs so that drinkers’ four-legged friends can enjoy a cheeky pint at the same time. And if their drinking makes them peckish, the pub has created a special canine menu with dog versions of human favourites, including a Sunday roast served with cat-flavoured gravy. The pub has made an effort to be a traditional pub run in a modern way, which includes welcoming dog owners with their pets to enjoy the atmosphere. 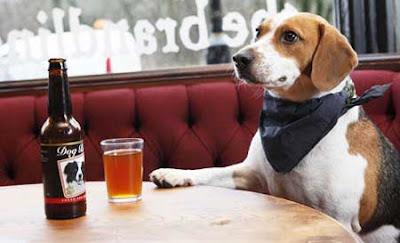 But rather than boring water, the pub decided dogs should join the craft beer revolution too and has started to sell the non-alcoholic beverage for them to try. It is made with beer ingredients of malt and hops, but also includes meat extract. It has gone down really well with the local dog population and the Brandling Villa had to reorder fresh stock after the first 48 bottles ran out in less than a fortnight. But ironically, manager Dave Carr’s own dog, beagle Franco, doesn’t like it. Dave said: “It tastes of beef. I don’t want to give it to my dog without trying it first. It’s pretty revolting and my dog doesn’t like it; but I’ve got enough people who drink my stock so it’s nice if my dog doesn’t join in. I wish we could have dogs in pubs here in the US.